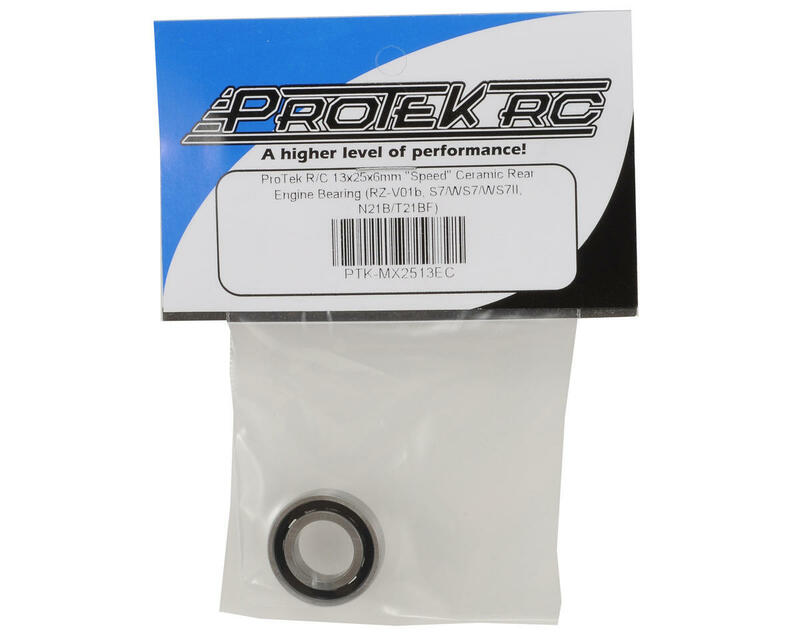 This is a Protek R/C Ceramic 13x25x6mm "MX-Speed" Rear Engine Bearing, and is intended for use with the O.S. RZ-V01b, RB S7/WS7/WS7II, and Novarossi N21B/T21BF off-road competition engines as well as any other engine that requires a 13x25x6mm rear bearing. ProTek MX-Speed engine bearings have 2 distinct advantages when compared to other bearings that provide decreased resistance, increased speed, load handling capabilities and extended bearing life. 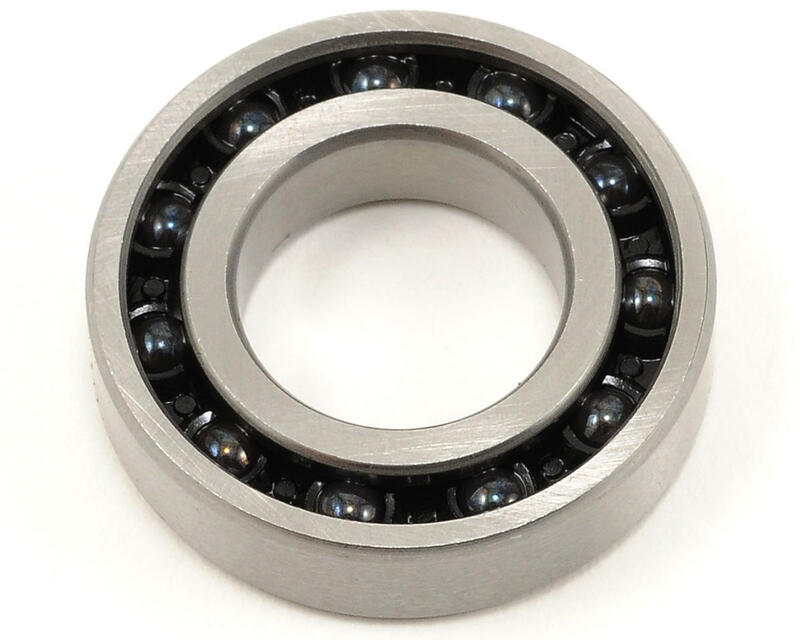 Precision Ball Races: A unique bearing race design is used that increases load capabilities, centering the balls in the middle of bearing race. 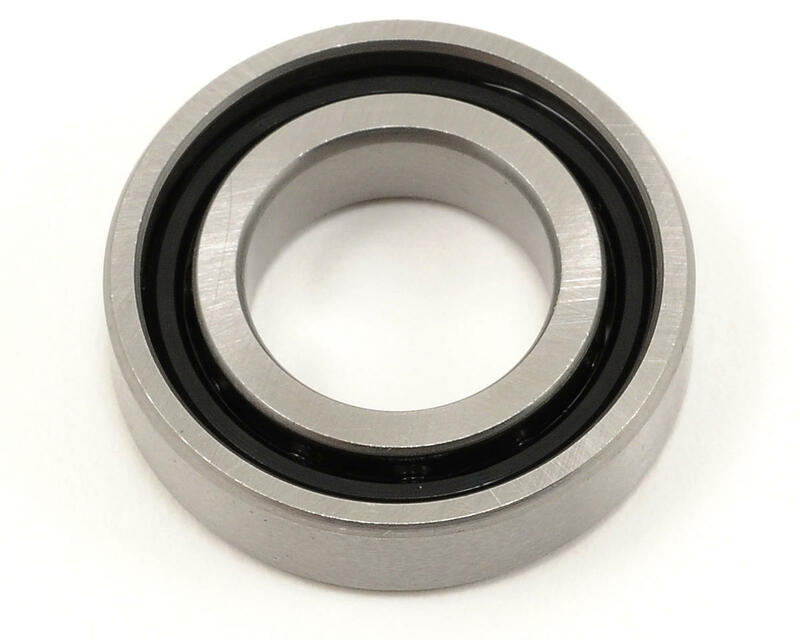 This allows the bearing to continue to rotate smoothly when the crankshaft is subjected to harsh side and radial loads. PA46 Nylon Cage: A stronger, thicker bearing cage material has been developed that allows the bearings to withstand high nitro content fuel and excessive temperatures. The reinforced PA46 nylon has been subjected to Heat Distortion Temperatures of 554° without failure. Our ProTek Ceramic Engine Bearings are a hybrid type, featuring Stainless Steel outer races with Si3N4 silicone nitride ceramic balls riding on a polymide inner race. Ceramic bearings have many advantages over standard steel bearings, such as decreased weight, higher RPM capabilities, increased corrosion and wear resistance, as well as reduced friction and vibration. So next time you purchase a engine bearing, when you ask yourself "Why should I buy Ceramic?" You should be asking yourself "Why shouldn't I?" High Speed: Hybrid Bearings can reach a resistance level of 1,200,000dN with grease lubrication, due to reduced slip, wear extent and heat productivity. Lightweight: The weight of ceramics is 60% lighter than steel, which decreases the centrifugal force and overall weight. Long Service Life: The service life of Hybrid Bearings is 3 to 5 times longer than that of steel in comparable working conditions. Self Lubricating: Even when poorly lubricated or with no lubrication, ceramic bearings will continue to function longer than steel under the same level of stress due to their self lubricating properties. Corrosion Resistance: Hybrid bearings have excellent corrosion resistance, and will continue to function while corroded. High Rigidity: The elastic ration of ceramics is 1.5 times greater than that of steel, this dramatically increases the rigidity of the balls. Low Friction: Ceramic materials have a low friction force. Even under the conditions of boundary lubrication, the surfaces are extremely smooth, so its friction force is low and the rotational friction moment is low. NOTE: This bearing should be installed so that the balls face the rear of the engine (towards the backplate), in order to allow proper lubrication. ProTek R/C is an AMain Sports & Hobbies brand.